Our mission begins with, and in a sense never departs from, Glorifying God. The first question in the Westminster Catechism (a historic Presbyterian creed) is “What is the chief end of humanity?” The response is that “Humanity’s chief end is to glorify God, and to enjoy him forever.” Every Sunday the church gathers in worship for this very purpose. And yet worship is more than what we do on Sunday: it is the whole of our lives individually and collectively rendered to God in joyful gratitude. But more specifically, what is the purpose of the church? In other words, if the church were a business, what would our business be? The church is in the human spiritual development business. We do this by making disciples in direct obedience to Jesus, who commanded us to “Go and make disciples of all nations.” (Matt 28:19). Our goal in all things is to build up and equip people of all ages to go into the world and transform it for God’s glory (see Eph 4:12). For most people, the first step of discipleship is to connect with Jesus Christ and his followers, the Body of Christ. Once connected to the Body of Christ, people must grow in faith as they deepen their relationship with God and their understanding of Holy Scripture. Finally, people serve in joy. We are blessed to be a blessing in the world (Gen 12:2). We do this both by serving within the church (ministry) and by serving the world outside our walls (mission). People often begin their lives of discipleship at different points in this process. For instance, some may begin their life of discipleship when they serve on a mission trip or become involved in a Bible study. 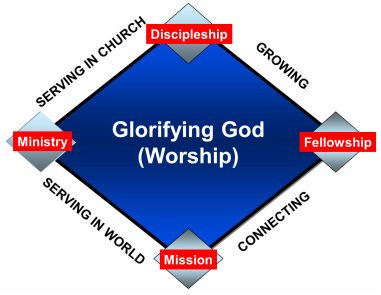 The point of this model is to identify the different spiritual components the church must help all people experience in order to become mature disciples of Jesus Christ.